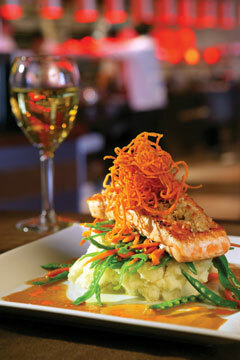 For those weary of burgers, Yard House also offers an array of seafood entrees, including ginger-crusted salmon with wasabi mashed potatoes. I invited a friend to the opening of the Yard House restaurant, at the glitzy new Waikiki Beach Walk, and she said yes, only to follow up with a little detective work and the question, "Is it like Chili's?" Never having been to either restaurant, I suggested she look up the menu online. "I did. It looks like Chili's," she said just before bowing out. How's that for food snobbery? The funny thing is, people sometimes accuse me of being a snob, when all evidence suggests the opposite. I've praised restaurants high and low. Sadly, in matters of food, like language, some people have trouble reading between the lines. Put a white tablecloth in front of them, and they'll swoon over anything. I've met foodies who will not set foot in a chain restaurant, especially ones with TV screens all around, but if they did, they would see just how far the culinary revolution of the past two decades has taken us. I also know culinary Neanderthals -- those averse to diversity beyond all-American burgers, mac 'n cheese and pizza -- whose days might be numbered if Yard House is any indication. Here, you'll find crimini mushrooms, truffle oil, jasmine rice and pasilla peppers. If we have not yet conquered bigotry on land, at least all things are equal on the plate, in a format designed to appeal to everyone. The restaurant, founded in Long Beach, Calif., by former Kailua resident Steele Platt, is ideal for large parties because it's one of the few restaurants that can easily accommodate varying preferences and degrees of dining sophistication. Surely I'm not the only one with finicky friends, like one who needs meat, one in need of healthy options, and various people who can't stomach a range of shellfish and seafood. In such company any food date is potentially treacherous. Normally I'm against the idea of being all things to everyone, but to my amazement, everyone has an equal chance of leaving Yard House in good spirits, so to speak. 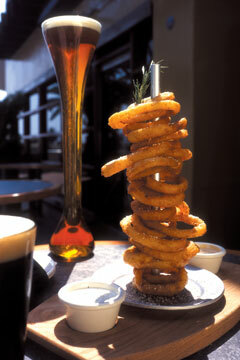 An onion ring tower accompanied by chipotle and ranch sauces is nearly as tall as one of Yard House's half-yard beer glasses. YARD HOUSE'S chief claim to fame is its number of draft beer choices, from Buds, Red Hook and Guinness Stout, to the sweet and fruity raspberry-flavored Lindeman's Framboise. I really don't know how they keep all the kegs straight. Naturally, the restaurant's centerpiece is a massive bar, needed to accommodate 130 taps, and the menu features such beer-friendly pupu as an onion ring tower ($8.50), chicken nachos ($9.45) and grilled Jamaican wings ($10.25) marinated in a jerk sauce with a hint of Cajun spices as well. The accompanying rum BBQ sauce is unnecessary, mainly offered as a sweet counterpoint for those who can't take the heat. Wimps. I'd be happy with the wings and spinach salad ($7.95) alone. The combination is enough for two because portions are huge, geared toward a pupu-and-beer experience, if it suits your mood. On other occasions you might go casual with burger, sandwich and pizza offerings, or try a little haughtier fare. The roster of burgers starts with a classic half-pound cheeseburger ($10.25) of Angus beef served on a potato bun. You can get that burger topped with pepper jack and roasted green chilies ($10.75); applewood-smoked bacon, cheddar and BBQ sauce ($11.35); or classic Bearnaise sauce ($11.50). Staffers raved about the St. Louis-style ribs ($23.95), but I enjoyed the accompanying creamed corn and baked beans, spiked with bits of cilantro, better than the ribs themselves. I might have been better off trying the lamb chops ($24.95) served with shiitake, corn risotto cakes and balsamic glaze, or a pepper-crusted Angus filet ($30.95) with brandy cream sauce. I was impressed by seafood offerings, such as miso Chilean sea bass ($25.95) and porcini-crusted halibut ($23.95), the latter with a heavy porcini cream sauce most remarkable for its use of white truffle oil, a luxury usually confined to the finest kitchens. The timing wasn't the best, leaving the fish somewhat dry, but the fact that the restaurant is doing such a great job within days of opening speaks volumes. Generally I try to give restaurants a little time to achieve flow before stepping in for a critique, but it was pretty clear from the restaurant's opening-day celebration that it was already ready. Staffers were quick, friendly and enthusiastic. Where did they find these people? I'm usually more accustomed to complaining about lackadaisical service. This time, my main complaint is about the loud classic rock that makes it necessary to yell to be heard. At least there are plenty of lubricants to prevent your throat from going dry.